Today, the third Thursday in November, marks the launch of the 2010 vintage of Beaujolais Nouveau. The young, light, fruity wines are often made with a special process called carbonic maceration, which leads to some of their characteristic aromas and flavors. Contributing editor Erika Szymanski explains this “fermentation without yeast” process. Carbonic maceration? Sure, I know what that is. I can tell you that it’s commonly used for Beaujolais, leads to fresh and fruity red wines, and involves fermenting whole grapes. I thought that I had a reasonable grasp of the concept. When winemakers say, “…and we did carbonic maceration with the tempranillo this year…” I nod and smile with as much equanimity as when they lob the phrases “malolactic” or “sur lie.” I wasn’t afraid to choose it as my experimental red wine variable in the lab I’m taking this fall. Then, one Thursday evening in October, I came home from our grape harvesting field trip looking forward to a Friday of processing merlot. Anticipating an easy afternoon spent emptying whole grape clusters into tanks, I thought I would do a little extra reading on carbonic maceration (CM). All I expected was a few tips to impress our professor and differentiate our wine from the rest. Within about ten minutes, the scales fell off my eyes. I had blithely tossed “carbonic maceration” into conversations for years while remaining almost totally ignorant of its implications. And what might those be? Typically, carbonic maceration occurs in an oxygen-free environment, ensured by gassing the grapes with CO2 in a closed tank. Some of the otherwise whole grapes will be crushed by the weight of the grapes above, and some winemakers make a point of leaving the grapes attached to the stems in whole clusters. Some winemakers, following some period (1-2 weeks) of CM, press the juice and allow traditional fermentation to occur without the skins. In terms of practical winemaking, removing grapes from the stems inevitably involves some degree of crushing – just imagine the act of pulling grapes off of stems on a large scale – and any tank is big enough that grapes at the bottom will be crushed by the weight of the grapes at the top. The experimental merlot and our little winemaking lab has been quite a different matter. Our CM ferments are entirely whole berry — even the grapes at the bottom — and perhaps only 50% remain attached to the stems. I doubt, however, that you will ever see a pair of commercial winemakers (or cellar rats) spend three hours carefully shoving whole Merlot grape clusters into two 5-gallon glass carboys on a Friday afternoon. Carbonic maceration is customarily reserved for red, not white wines. Consider that for white wines, skin contact is usually minimal while CM naturally involves prolonged, if gentle skin-juice contact. Interestingly, though, up to 15% of a tempranillo can contain white grapes — usually viura — and it seems that white bunches are co-fermented right along with the red grapes in this “non-strict” version of CM. Beaujolais Nouveau being the best example, the sole destiny of a CM wine is to be drunk young. These are party wines – some say kicked-up grape juice – with distinctive flavors that remind revelers of everything from raspberries to bubble gum, bananas, to grandma’s perfume. Like it or hate it, the contributions of the CM show in tannins, aromatics, and acids. Less total tannin will be transferred from the skin to the juice contained inside the grape per unit time. On the other hand, CM usually allows for a longer total contact time between juice and skin. Since the way tannins are transferred is different, the type and feel of tannins should be different, too. The tannins present in the inner layers of the grape skin will preferentially migrate into the fermenting grape interior, while minimal tannins will be extracted from the outer skin layers. In other words, a CM wine will be lighter in color and body than its standard-processing counterparts. Aromatics: That unmistakable floral-raspberry-hair salon aroma of CM wines is related to higher levels of volatiles like vinylbenzene, benzaldehyde, ethyl cinnamate, and ethyl phenylacetate, to name just a few. Monoterpenes, a class of hydrocarbons related to floral-fruity aromas in grapes (and other fruits), are important, too. An overall higher concentration of monoterpenes in CM wines also helps explain their “fresh and fruity” nose. Acid: As sugars are fermented into alcohol, grape enzymes also ferment malic acid — as much as 50% of the total concentration — to alcohol. Malic acid, a sharp-tasting acid found at high concentrations in grapes, is converted to lactic acid by bacteria during the slow process of malolactic fermentation in most red wines. This “malo-alcoholic fermentation” means that CM wines can forgo malolactic fermentation (avoiding buttery-soft lactic flavors while decreasing sharp malic flavors) and maintain the perception of high acidity with lower actual acidity. It also saves precious time, allowing the 2010 Beaujolais Nouveau to be released on the third Thursday of November while the conventionally-fermented reds of 2010 won’t make their debut for several months. Start looking, and CM appears much more widespread than the classic Beaujolais example. In Rioja (particularly the Alavesa sub-region), Spanish winemakers use CM to foster fruitier flavors in tempranillo wines intended for blending. New world winemakers from California to Australia making “Nouveau”-style wines have taken up the technique with gamay and other varieties. 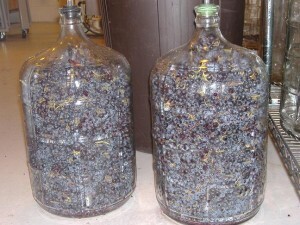 And what about those 5-gallon carboys shoved full of whole merlot grapes and topped off with gas? After ten days of “chillin’ in the winery” (as my labmates constantly remarked), the grapes looked as fresh as the day they were picked. Though it looked as though nothing was happening, those chill grapes were very quietly metabolizing in there: the wine we pressed off that day strode into its tank with 2.5% alcohol, a fruity nose, and a very pretty shade of deep fuchsia. The second carboy, sentenced to a full month of the CM treatment, is scheduled to be pressed off tomorrow. Those grapes look a little tired – metabolizing for 30 days straight must be hard work! – but they’re still intact. As for the smell, color, and alcohol level, I’ll keep you posted. I’m really curious… how hard was it to get the grapes back out of the carboy, and what was the clean-up like? Nice article Erika. You left oput the part about fermenting the juice (must) to dryness in the absense of skins and seeds after it is pressed. Another technique as used in Cru Beaujolais is to let an alcoholic fermentation start after the CM period and pressing off at ~7 brix, before the alcohol starts to extract too much bityterness from the stems. The fermenting juice then completes alsoholic fermentation in barrel. I hope the wine turns out great! Well explained in language that strikes the right level of seriousness. I’m curious on your thoughts about the use of this technique in Piemonte. Stephano, I haven’t heard about the use of carbonic maceration in Piemonte, but I wonder if some of the region’s Grignolino and/or Dolcetto is fermented this way. Though I can’t find mention of it in any of my resources, it makes sense that the Piemontese might have their own local version of Vino Novello the Italian equivalent of Beaujolais Nouveau that appears to be particularly characteristic of Sicily. Stephano, do you have experience with particular Piemontese wines that lead you to ask the question? I’d be interested in hearing about them. Good show, Erika. Enjoyable reading. However your comment that “■The tannins present in the inner layers of the grape skin will preferentially migrate into the fermenting grape interior, while minimal tannins will be extracted from the outer skin layers.” just doesn’t sound right. During CM, the alcohol concentration of the pulp increases, so it will “pull” more tannin into the juice. The outer layers aren’t in contact with the juice, so less extraction from there (especially if the grapes are pressed before traditional yeast fermentation). Erika, does that make sense? Bien sur, Tom. You just beat me to the punch line. And you’re right, David, that that was far from the greatest syntax I’ve ever constructed and it doesn’t sound quite right. My apologies. So after pressing the wine it will continue to ferment to dry without addition of any yeast or nutrient. Can the container be completely sealed or do you need a air lock. I was considering using a poly barrel with a lid. Do you have to purge tank with co2 or can you fill to top and seal? Also as the grape enzymes ferment the malic acid there is no problem with a spontaneous mlf occuring. Am I understanding that correctly?